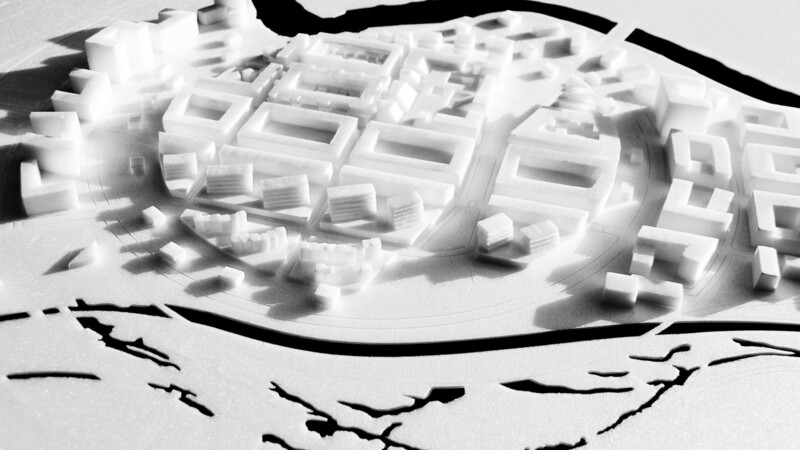 for interesting solutions in vernacular architecture.The design proposal is focused on accommodating the program depending on the specific geographical position of the plots. 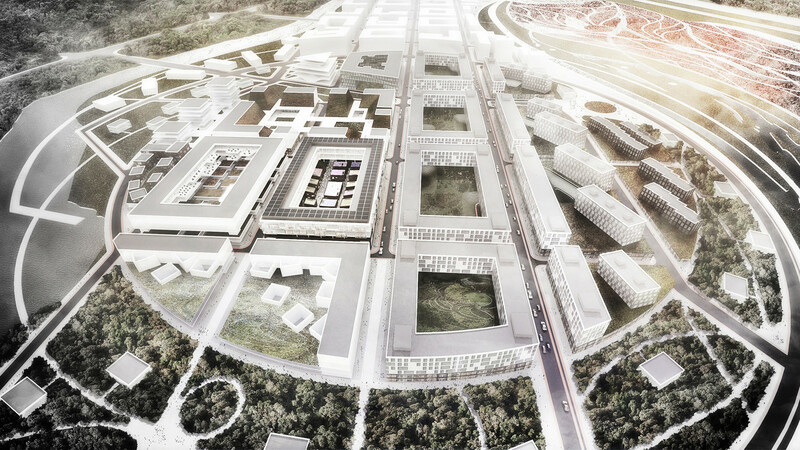 With blocks re-enforcing a rational street grid system with generous spaces inside the courtyards as a concept base, additional modifications were introduced.The aim was to connect the core of the Molewa area with the Flower Garden theme and at the same time create a modern sustainable city center which is deeply connected with Chinese culture, making architecture and the city a tourist destination of it’s own.As a result a vibrant town centre would be created which provides a neighborhood feeling and showcases a practical,green sustainable approach. 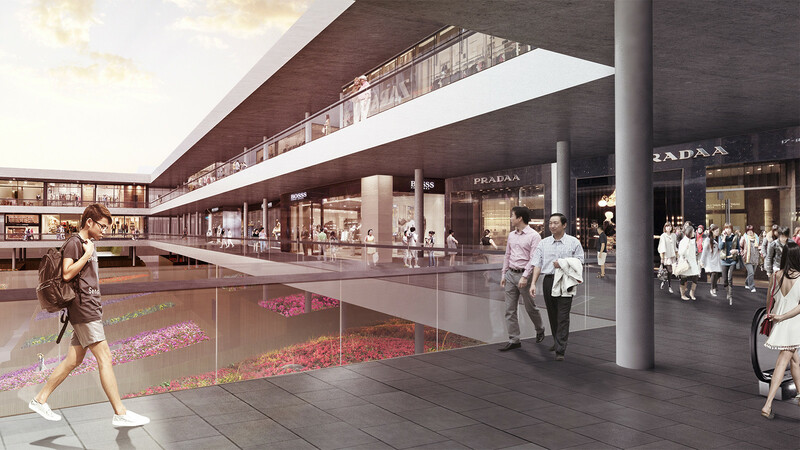 Following the principle of buildings positioned on large floor plates, the streetscape would be framed with a continuous 7m wall forming a base which is visually not overwhelming.The retail groundfloor would open in specific spaces providing connections through quarters and revealing open elevated courtyards with landscaped flower gardens and crater looking meeting places for residents to socialize .The area underneath them would host parking levels providing direct access to apartments which would not be positioned underground.The small scale ambient would be also emphasized by a diverse outlook of each building.Depending on the function a different massing would be applied not only giving a strong sense of identity already visible in each solid but enabling visitors to orientate themselves in this big area. Cultural traditions would find it’s expressions in their facades which would celebrate in a modern way local materials and details.Every street with it’s facades would provide a different character to create a versatile public realm atmosphere. 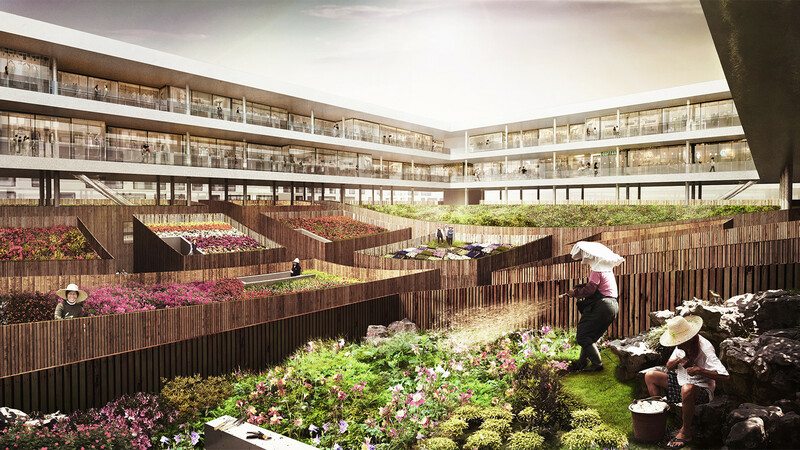 Flowers as the main theme and an extremely important Unique Sales Point of the area design would define the character of each plot .By introducing them on many levels ranging from horizontal landscaped podiums to greenroofs or vertical inclined green walls the integration of Molewa with the adjacent Flower garden attraction would be ensured. The Masterplan area would be strictly tied to nature in it’s plot division as well.Rather than dividing it with program it would be defined accordingly to it’s approach towards the flower garden and nature along the main East West Access Route. The arrangement of the southern residential part offering a pleasant and sustainable living environment with housing blocks and townhouses with generous terraces, roof gardens and penthouses expressed in it’s roofscape,would be directly south-oriented according to views. These plots would accommodate buildings with a smaller footprint allowing to create park views from more distant buildings. The more distant from the Flower Garden northern part of the master plan featuring commercial and cultural activities and residential program would have a more closed character with building frontages aligned to the streets establishing a strong street pattern.Here Molewa would feel indirectly linked to the flower garden not by exposing it but by referencing in the architecture specific plants used in the theme park. Each quarter would therefore be different in character and explore color and diversity. Besides emphasizing the role of green areas additional sustainable strategies would be introduced to provide low carbon city model. Gardens together with porous surfaces on plazas and pavements would perform as a rainwater harvesting system.Solar energy would be gathered by rooftop solar panels.Building materials would be carefully selected from certified sources. Vehicular and servicing movement within the area in favor of the pedestrian movement would be rationalized by creating connections with slow traffic without affecting the communication of the area as a whole. 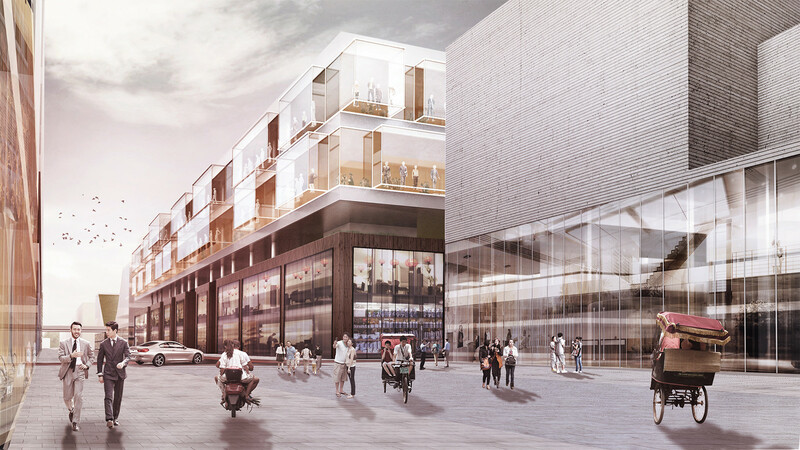 With consumption as a factor which creates cities or even sometimes which is a condition of existence, there is no longer a boundary between a shopping mall and a modern attractively designed exhibition space.They both appeal to the viewers ,their ability to spot things and their perceptiveness and imagination. 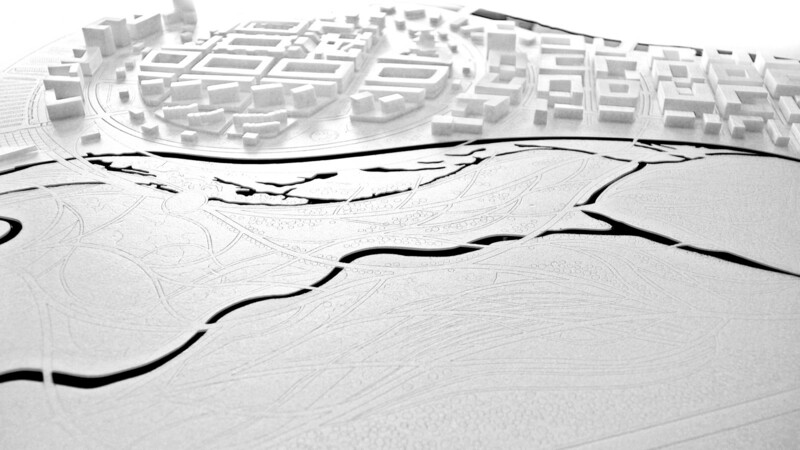 The proposed design takes full advantage of this approach and materializes it in it’s form which is additionally embedded in it’s cultural and environmental context and tied to traditional Chinese planning in many layers. 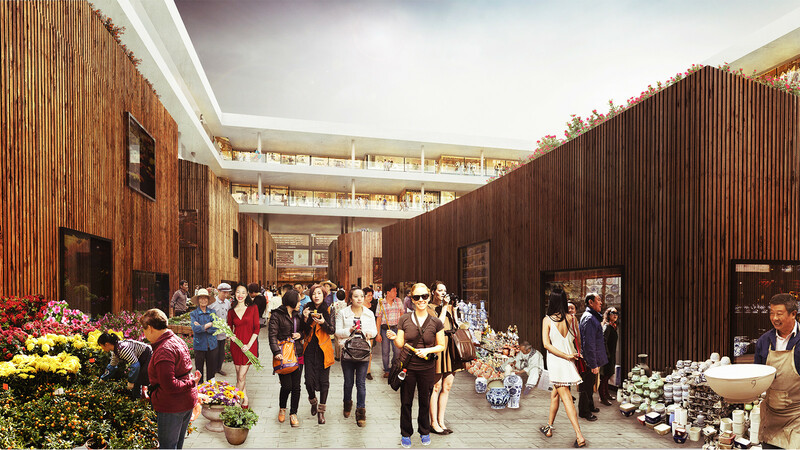 The building would consist of a series of shopping streets with shops and partially detached offices all accessible from an external path, referencing the spatial arrangement of traditional Chinese merchandising alleys, stacked on top of each other.It’s facade would be extended in specific places and fully glazed including also it’s undersides, allowing to improve the commercial value of presented high-end products by maximizing it’s exposure from the street level. 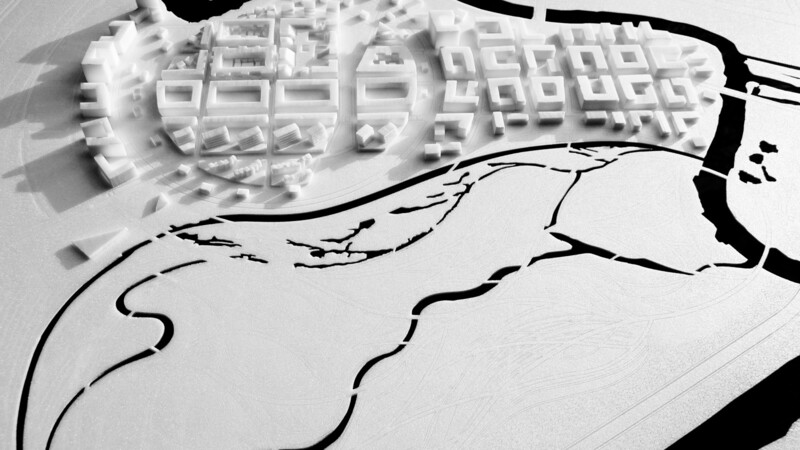 Influences of vernacular architecture and planning would be also visible within the plan of the ground floor which references traditional Chinese siheuan urban grids and in section with it’s hierarchical order. Rather than creating a continuous perimeter building the idea of openness would be emphasized not only by creating groundfloor openings to the courtyards but also by separating the shopping block from groundfloor market areas to allow control depending on the tourist season.This would create a hybrid structure with a vernacular market offering special or traditional goods,mostly flowers but also handmade craft, artworks, souvenirs sold in small separated blocks.They would be rented out faster and together with a modern shopping block positioned on top with big internal spans, the whole building would be easly operational.Besides retail the upper levels would also feature office spaces wich could function as the building’s administration. 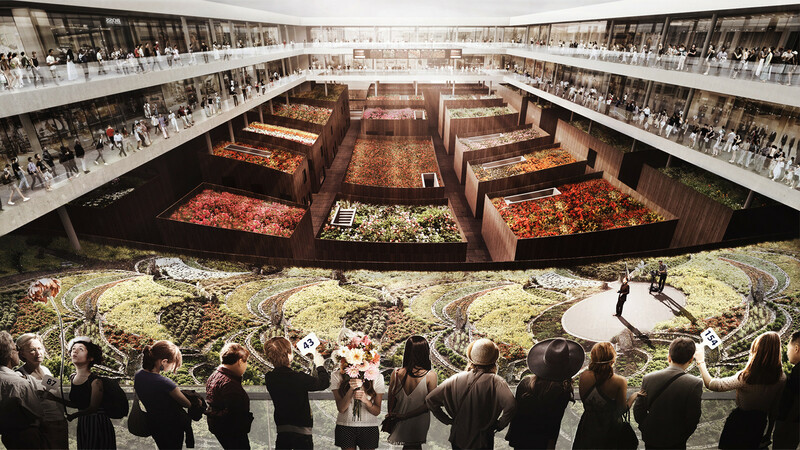 The parkland experience would be introduced in a way to bring flowers and color deep inside the plot on the courtyards making them visible from every level.They would be featured not only on the internal alleys on stands but also on top of the shopping boxes where green rooftops would provide additional informal public spaces for residents and visitors. The important for this region flower theme would be stressed out also in the added program. Auctions would take place inside the building’s courtyards where flowers grown in the adjacent Flower Theme Park would be sold.The trade could take place every day or during weekends depending on the changing needs around international special days such as Valentine’s Day and Mother’s Day or traditional Chinese celebrations.The administration offices which would logistically take care of the auction’s operations would be located on the top levels allowing to have a clear overview and control of each event.Shopping streets would turn in those days into viewing terraces for auction bidders and visitors looking into colorful flower carpets on courtyard’s rooftops. 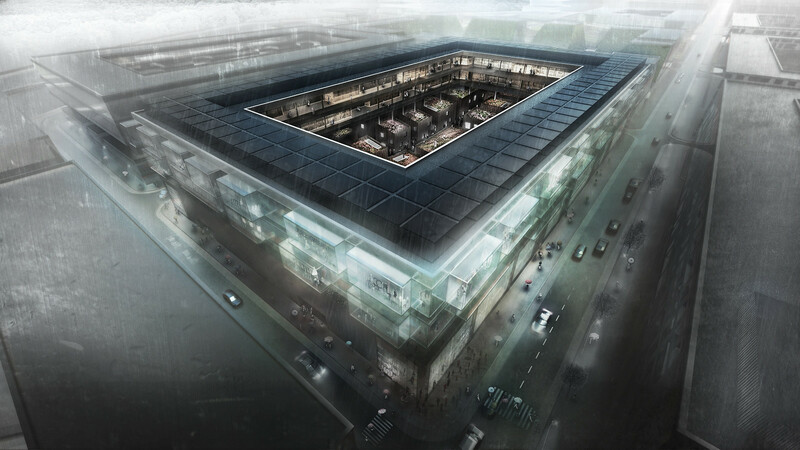 The Shopping Street building would be also a truly modern sustainable hybrid structure providing through it’s form and spacial arrangement a series of energy harvesting and minimizing solutions.The vertical division of the main solids would provide a chance to improve natural ventilation throughout the building and cool the ambient during warm days.Courtyard rooftops and all paved areas would have a porous surface which would collect rain water.It would float directly to big water tanks which would cover almost all of the underground footprint area due to the lack of parking floors in these levels.Grey water re-use would be encouraged by filtering and pumping it back to the upper levels of the building.It’s rooftop would not be accessible to the public and would be entirely covered with PVC solar panels.